We love Christmas and have launched our Skeff Christmas Countdown campaign! We thought it would be appropriately festive to countdown the 12 days to Christmas with our own special advent calendar, SkeffADVENTure, of course! To reward our loyal social media fans and customers, we are giving away a daily prize from one area of our entertainment destination business, and on Christmas Eve we will give the 12 prizes to one lucky winner! Here’s how we are counting down the 12 days of Christmas this year. Day 1: Happiness is warming your hands on a hot cup of tea on a cold morning. Call in and have tea on us for a whole week. Day 2: Feedback is the breakfast of champions. Tag three of your champions on our Facebook Page for breakfast with us and we will pick up the tab. Day 3: Friends buy you lunch. Best friends join you for lunch. Tag three of your best friends and have lunch for four on us. Day 4: Anywhere with you is a great place for me! Who do you want to have an overnight with at The Skeffington Arms Hotel or our sister hotel in Athlone, The Price of Wales. Day 5: When’s the last time you had date night? You get a minder, we’ll reserve the table and look after the rest. Day 6: Cocktails anyone? We’ve got a private cocktail party for six. Who will you take along? Day 7: Do you know your single malt from your Midleton rare? We want seven of you to join us at Vault Whiskey Bar for an evening of whiskey tasting. Day 8: Are you the biggest rugby fan in the West? To celebrate the 2017 rugby season our Skeff Sports team are giving away tickets for Ireland V Wales in March. Day 9: We are open until 2am six nights a week so here’s a €50 Bar Tab and a bottle of Moët on us. Day 10: VIP all the way with not one but two Skeff Rewards Cards loaded with 5,000 points worth €50 each! Day 11: Who wants a Karma VIP Experience worth €100? Day 12: Are you another year older in January? Happy Birthday, cause we’re hosting your party! Cake, cocktails and finger food for 20 people. 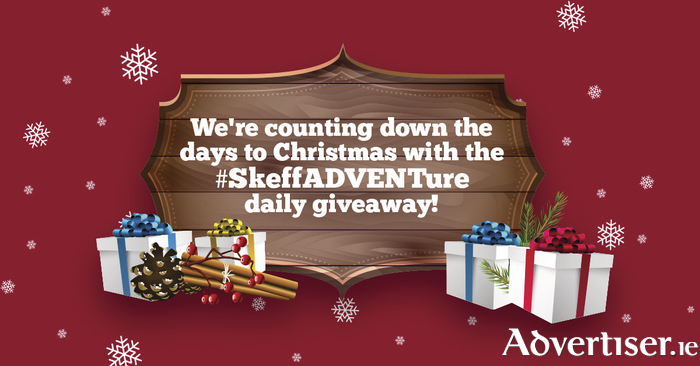 So to be in with a chance of winning go ahead and enter the #SkeffADVENTure Christmas Countdown Competition right now. Good luck everyone! To enter your must add your email address to our official Facebook Contest app. A random winner from the email addresses collected daily will be announced at 10pm each night. Our overall winner who will take the SkeffADVENTure 12-prize package will be announced on Christmas Eve. This winner will be chosen from all entrants over the 12 days. This contest is open to legal residents of Ireland who are 18 years of age or older at the time of entry and who have Internet access and a valid e-mail account prior to the beginning of the Contest Period. The Skeff Late Bar as sponsor, has the right to verify the eligibility of each entrant. The daily prizes and overall prize are non-transferable. No substitution or cash equivalent of prizes is permitted. The announcement and instructions for collecting the prize will be sent to the e-mail address supplied on the potential prize winner’s entry form. Each entrant is responsible for monitoring his/her e-mail account for prize notification and receipt or other communications related to this contest. If a potential prize winner cannot be reached by Administrator (or Sponsor ) within fifteen (15 ) days, using the contact information provided at the time of entry, or if the prize is returned as undeliverable, that potential prize winner shall forfeit the prize. By participating, each participant is granting The Skeff Late Bar permission to use his/her email address for future marketing purposes. However, you can unsubscribe at any time by emailing [email protected].